Mystery Ships Of The Great Lakes: Did Columbus Sail The Great Lakes? Did Columbus Sail The Great Lakes? No, but a replica of the Santa Maria, the flagship of Columbus' 1492 voyage, sailed the St. Clair River for many years. Andrew Cuthbertson and his son Tom of Cuthbertson Marina in Algonac, Michigan built the ship, which was aptly named the Santa Maria II. The Cuthbertsons completed the Santa Maria II in 1936 and sailed it until the late 1940's when it was sold and sailed to St. Augustine, Florida for use as a theme restaurant. A tropical storm sank the Santa Maria II in the mid-1950's and the ship is believed to have been dismantled some time after that. In the early 1940’s my Grandfather was on Harsen’s Island when he filmed the Santa Maria II. Click below to view this brief but rare footage! The Santa Maria II was built by my grandfather and uncle before I was born in 1943. He however did not sail it until 1962 and then dismantle it. It is my understanding that it was sold (before I was born) to someone who took it to Florida and it was subsequently used as a restaurant for a while and then sometime thereafter it burned and is resting at the bottom of one of the canals in Florida. Thanks for writing and clarifying the story of the Santa Maria II. The information I have is that the ship was built in your Uncle’s backyard. Construction started in 1933 and the ship was finished in 1936. The movie taken by my Grandfather is from approximately 1942 or 1943. I thought the photo was a bit later, 1946 or 1947 but perhaps not since you say your family sold the ship prior to 1943. 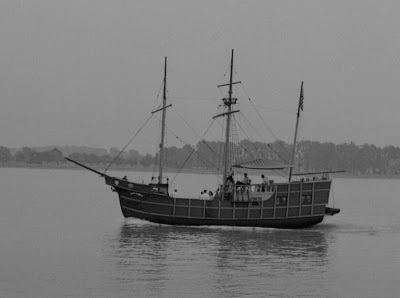 It is not surprising that the ship ended up in Florida as they have always celebrated pirate history with replica ships, theme parks, the Gasparilla Pirate Festival, etc. I’m sorry to learn of the unfortunate end of the ship but I’m glad the memory of the Santa Marie II lives on! Thank you very much for the comments, insight and information on the Santa Maria II. If the Santa Maria II was destroyed by Hurricane Andrew does that mean it was still around in the early 1990’s? I fixed the You Tube link so you can now watch your Great-Grandpa’s ship under sail! Thanks for writing! I appreciate your kind words as well as the additional information about the Santa Maria II. Please let me know when you post the launch photos, as I would be very interested in seeing them.